I cleaned the season’s first melted chapstick out of my car yesterday. Summer must be around the corner. Time to check the expiration date on last year’s sunscreen and buy some new flip-flops. Our bleak winter weather lasted too long, and I’m hungry for the sun. I long for the first day that’s so hot I can feel it warm my bones. I look forward to summer’s easy-going vibe, too. Released from the confines of winter clothes and school calendars, summer feels lighter. More freedom. Fewer rules. Although I travel quite a bit during the summer, the pace seems slower—more relaxed. As a mom, I’m relieved that our lives won’t revolve around Sarah’s high school schedule for the next few months. The Millers can gravitate back to our nocturnal natures—staying up too late watching movies and eating kettle corn. Summer liberates my reading and writing life, too. I indulge in reading and writing binges instead of snatching time in between other things. I dream of languid days curled up under my ceiling fan—reading and writing for as long as I wish. Delicious as eating peaches over the sink. 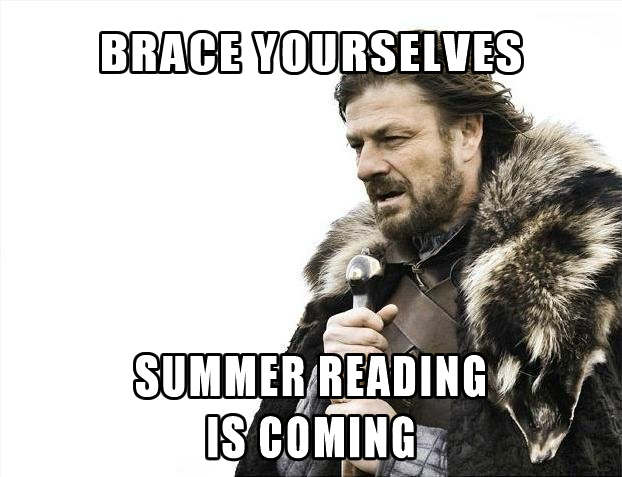 Unfortunately, summer doesn’t offer reading freedom for all. As another school year winds down, I see renewed emphasis on summer reading programs, required summer reading lists, and contests. Teachers and administrators know that children who do not read over the summer lose significant academic ground when they don’t read. Summer learning loss is cumulative and creates an achievement gap between low-income and middle-income students that widens over time (Allington &McGill-Franzen, 2012). No matter what children accomplish during the school year, if they don’t read over the summer, their learning stalls or regresses (Cooper, Borman, & Fairchild, 2010). Concerned about students’ summer reading, many educators and parents implement reading incentives and competitions to motivate children to read more. These well-meaning folks may be unaware of the negative long-term effects of such rewards. A meta-analysis of 128 studies on the effects of rewards concludes that, “tangible rewards tend to have a substantially negative effect on intrinsic motivation. Even when tangible rewards are offered as indicators of good performance, they typically decrease intrinsic motivation for interesting activities (Deci, Koestner, and Ryan; 1999).” Readers motivated for personal reasons are more likely to remain interested in reading than readers who are externally motivated through rewards (Marinak & Gambrell, 2008). In his landmark book, Punished by Rewards (1995), Alfie Kohn describes why reading rewards undermine long-term goals to engage children with reading, “What matters more than the fact that children read is why they read and how they read. With incentive-based programs, the answer to “why” is “To get rewards,” and this, as the data make painfully clear, is often at the expense of interest in reading itself.” Short-term reading excitement for a contest does not spark long-term reading engagement. Reading contests can harm students’ reading self-efficacy and interest. Why would we employ reading initiatives that derail internal reading motivation and divide kids into reading winners and losers? I have never met an adult who became a lifelong reader because they won a theme park pass or a t-shirt. Talking to kids around the country, many admit to me that they overestimate the pages, books, or minutes they record on summer reading logs, so they can win a prize or avoid negative consequences. When we communicate to children that the only reason to read is to earn a reward or grade, we fail to impart reading’s true value. Reading is its own reward and it bestows immeasurable gifts on readers. While you may be able to share the success of individual summer reading programs, there is little evidence that such programs foster lifelong reading habits or engage children with reading after the program ends. 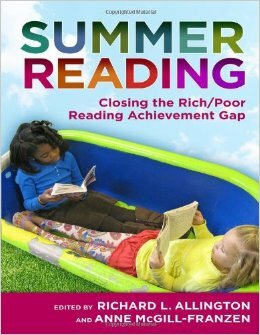 I suspect that most schools with successful summer reading programs invest in students’ reading lives all year long. If we want to engage our students with reading over the summer, we must focus our efforts on the fundamental best practices that encourage children to read for a lifetime instead of short-term external goals. Time to read. We must communicate to our school communities the importance of reading over the summer. Reading is a wonderful way to stave off summer boredom and increase students’ vocabulary acquisition, fluency, and background knowledge. Share research about summer reading loss and the benefits of summer reading with family members and school staff. (I recommend Richard Allington and Anne McGill-Franzen’s recent books on summer reading.) Brainstorm with students a list of reading emergencies when they could read over the summer, such as car trips and rainy days. Access to books. We must ensure that every child has access to engaging reading material over the summer. Many students lose their book access when school and classroom library close for the summer, and lower-income students feel this loss the most. Consider opening your school library for a few hours a week over the summer. Arrange for students to borrow books over vacation. Invite the local public librarians to your school to share their programs and pass out library card applications. Choice in reading material. We must provide opportunities and encouragement for students to self-select their summer reading material. Choice is a powerful factor in human motivation. Providing children choice in what they read fosters engagement and increases reading motivation, interest, and effort (Gambrell, Coding, & Palmer, 1996; Worthy & McKool, 1996; Guthrie & Wigfield, 2000). Children who are given choices for summer reading read more and report higher reading engagement and motivation after summer ends (Kelly & Aligne, 2015; Allington & McGill-Franzen, 2012). Summer reading lists should include titles selected by students and provide students diversity in reading levels, formats, genres, cultural and historical perspectives, and topics. When offering books for summer reading, provide students free choice options. Celebrate children’s book choices. When we value all reading, we value all readers. Family and community involvement. We must encourage our school communities to model and share positive reading habits with children. Parents who read and share reading with their children influence children’s future reading habits. Teachers who are engaged with reading are more successful at engaging students with reading (Nathanson, Pruslow and Levitt, 2008). Invite school community members to set and share their own summer reading goals. Encourage adults to invest time reading aloud and alongside children over the summer. For the past seven summers, I have challenged myself to read a book for every day of summer break. I launched the first summer #bookaday challenge on my Teacher Magazine blog in 2009. The #bookaday challenge began as my public commitment to read more over the summer, and invite others to do the same. Over the years, #bookaday has grown into an online community for celebrating books and supporting each other as readers. Participants post recommendations and queries all year under the #bookaday hashtag and many people have forged professional and personal reading relationships that last far beyond Labor Day. Beyond the goal to read and share, #bookday celebrates reading freedom. We can choose what we read, when we read it, and how we respond to what we read. No strings. No arbitrary markers of success. The #bookday challenge is the antithesis of a summer reading contest. No one keeps score. No one competes. Everyone who reads is a winner. That best seller sitting on your nightstand collecting dust? The books you got for your birthday last August? That series you never finished? The picture book pile stacked on your office floor? Don’t you have books that glare at you because they sit unread? What would you like to read this summer? Set your own start date and end date. While #bookaday encourages people to read more, the challenge is personal, not public. The only reading goals that should matter are the reading goals we set for ourselves. If reading more books doesn’t meet your reading needs, what would you like to accomplish as a reader this summer? Commit to reading a little more. Push yourself to read outside of your comfort zone. Reread old favorites. No matter your goals, #bookaday offers a community of readers who will embrace you. In the spirit of increasing book access and sharing books and reading, I am challenging myself to give away a book for every day of summer break. Every Saturday, I will randomly select one person who is actively using the #bookaday hashtag on Twitter, Facebook, or Instagram. Winners will receive ten gently-read young adult and children’s books from my personal and classroom library collections. #Bookaday drawings will begin on May 16th and occur every Saturday until September 5th. Books will include a random assortment of advanced reader copies*, paperbacks, hardcovers, picture books—whatever I put into the box. All I ask is that you read the books, or give them away to kids who need them. One book will take them farther than any pizza coupon or award certificate ever could. Enjoy a wonderful summer of reflection, rest, and a little reading. I hope our paths cross online or in person this summer. I look forward to meeting you and swapping a book recommendation or two. *Selling publishers’ galleys or advanced reader copies violates copyright laws. If you receive an ARC you do not wish to keep after reading, donate it or throw it away.